The single carb, late model Meriden TR65 Thunderbird promised Steve Wilson a simple life. But with a new old bike, there’s rarely any such thing! It was, in the words of crime writer Dorothy L Sayers, “an old antagonism.” She was referring to the street rivalry between Scott and Norton in the 1920s and 30s, but the neat phrase could also apply to that between Triumph and BSA twins in the 1950s and 60s. Or Triumph and Norton twins, which was where I came into motorcycling in 1962. At college my Dominator 99-riding pal convinced me that Nortons were the only option. Was there a class element to this? Nortons were “Unapproachable”, successful on the track, relatively scarce and reassuringly expensive. Certainly no one at the university, including our boho fringe, ran a Triumph, though one chap was building a Triton. Everyone knew ‘Triumphs didn’t handle’, and before Hele worked his magic from 1963-on, this was true (though it could be lived with). And there was the ubiquity – being keenly priced and charismatic, Triumphs were the default position for British twins, much like MGBs would be for British sports cars; and looked down on by some for being common in both senses. Also Edward Turner’s cost-cutting meant that a majority of postwar models didn’t feature magnetos, and thus were hampered by some dubious early coil ignition systems. So, long story short, the hook was set and I didn’t care to own a Triumph. The only one I did finally come by was a 250 oil in frame T25SS, for trail-riding, and I changed all its transfers and badges to ‘BSA.’ Well, they’d all been built at Small Heath anyway. In 30-odd years riding classics for magazines, inevitably perceptions were altered. The stand-out Triumph experiences were the smoothness of the eager early 1950s pre-unit 650s, but also exciting 1969-on T100 Daytonas, a pleasant Tiger Cub, a crotch-rocket 650cc T120 TT which really let loose the unit engine’s potential, and ‘even’ a couple of outstanding 750cc T140s, a blue-printed T140D, and a very carefully built and modified eight-valve TSS. But I wasn’t tempted – never a real speed merchant, my priorities were a machine I could rely on, and I’d found this in my swinging-arm BSA A10, which though slower than the T140s, had a magneto and wasn’t trying to shake itself to bits. I wrote ‘even’ because I’m old enough to have lived through the Meriden co-op period. 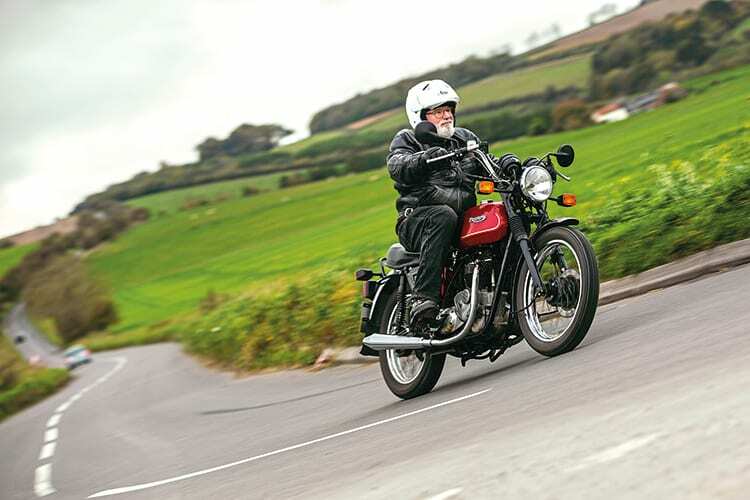 While as Britbike enthusiasts we all ached for this last gasp to do well, the inescapable reality was that they were hamstrung by lack of cash – and the ultimate British twin had already aced the T140 Bonneville they were making. I mean the 750cc Norton Commando, which though high maintenance, was faster, handled okay, and was much smoother thanks to the Isolastic frame. I did own a couple of o.i.f. twins, 1971-72 BSA A65s. They handled better than any A65 I’d experienced, but on a return trip from Spain and France, a night outside in the rain got to the spaghetti-like ignition wiring; a local car garagiste traced the fault, but 150 miles further north the electrics expired again, as wires disturbed by getting the tank off/on had worn through, and since I couldn’t find where, I came home via the RAC. Note to self: no more touring on o.i.f.-ers. Then finally a Triumph really got to me. It was a very rare Tiger Trail, the TR6T 650, of which only six had been made. It belonged to m’learned friend Erum Waheed, a London-based barrister who was fixated on, and highly knowledgeable about, late model Triumph twins, and frequently rode one of his own to work. Now under less than ideal test conditions – rain, back streets around the Ace cafe, an iffy disc front brake whose lever came back to the bars – one thing shone through. The 650cc engine was an absolute peach. Torquey, forgiving, extremely smooth, with Triumph responsiveness in spades, its five gears coped with everything from narrow car-lined roads to the traffic on the North Circular. I was instantly and deeply impressed. This was a couple of years ago, and the charismatic yellow Tiger Trails’ prices were already heading skywards, even if I could have found one of the ultra-rare 650s. But that engine had been designed originally for another of Meriden’s brave late innovations, the TR65 Thunderbird roadster. Produced from April 1981, the TR65 was the co-op’s shot at a budget model. It cost £200 less than the Bonneville and was cheaper to insure, but it was all a bit academic, as Japanese models with better spec and higher performance were already cheaper than both, and the majority of those after a Triumph wanted the 750cc Bonneville.